From the New York Morning Journal -- "Do you ever make dresses for court presentations?" asked a reporter of a famous Fifth Avenue modiste. "What court do you mean? The English court? We certainly do, but not so many as one would think. Most American girls, or their mamma, are so afraid that the style will not be strictly English, you know; so they wait until they get to England or Paris; but some of the most beautiful dresses ever seen in the Queen's drawing room have been made in this city, and that I know to be a fact." "How must the dress be made?" was then asked. "Is there any set style?" "Oh, yes. For a debutante, her first dress must be pure white. The material may be either crepe de chine, satin, silk, velvet, plush, or any rich material. Then the train must be a court train, that is, flowing from the waist and very long, with a petticoat front. The bodice must be cut low in the neck and with short sleeves, and as many or few ornaments as they desire may be worn, and flowers to suit the fancy. Married ladies may go to the Queen's drawing-room in black or colored silks, velvets, etc., but all the dresses must be cut low in the corsage, as that is a rule of the court." "I should think it would be dangerous for ladies with delicate frames to go without a wrap," was observed. "So it is, young man," replied the modiste, "and some ladies do wear high necks, but they have to be especially excused by the Queen." "Can you tell me when the Queen's drawing-rooms are held?" "Well, in May and June principally. Those months, and July, are the height of 'the season' in London society. But as for the manner of presentation, it might be best for you to see someone who has enjoyed that distinction." The lady kindly intimated that a certain young lady uptown could give the information, and she was accordingly sought. "Were you presented at court?" inquired the reporter. "Oh, yes, indeed," she replied. "I attended two drawing-rooms, both in May. At the last one, the Queen was unable to be present, and the Princess of Wales received her place. But the first, that was the exciting one. When I went to London, mamma was determined that I should make a good appearance. My dress was made here and it was beautiful." "What was it?" interrupted the journalier. "Well, the train was of white poult-de-soie, made very long, with a ruching and puffings of tulle, fastened at the shoulder with little narrow white satin ribbons and tiny bouquets of ferns and Victoria roses, out of compliment to Her Majesty, you know. The corsage and petticoat were of ivory-white satin, covered with pearl embroidery on tulle and caught here and there with clusters of the ferns and Victoria roses. Then I wore a tulle veil with white roses and maiden-hair ferns and pearl ornaments, and I carried the loveliest big bouquet of Victoria roses you ever saw. I felt just as though I was going to be married but not at all timid. Most of the English girls at the drawing-room, even of noble families, were awfully frightened at having to kiss the Queen's hand and back out gracefully without stepping on their trains." "I should think it would require some practice to know how to do that," observed her listener. "Why, of course. Don't you know you have to go to a regular teacher to learn how to act? It's a fact. 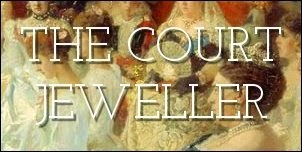 First you wait until it is time for you to be presented and then your name is called, and then you come forward with the lady who presents you, and bow first to the Queen, then to the Princess of Wales, the Princess Beatrice, the Duchess of Connaught, and down through an awfully long list of notables. I can't remember them. Then the oceans of people in attendance and the diplomatic ambassadors! After you have bowed low to all the royal family, you back out and make room for someone else, but you mustn't turn your back on royalty or you will suffer." "How do you know if you can be presented?" "Well, it's very easy for an American girl, if she has money, and it is good-looking and well-bred. Some English lady of rank who goes to the drawing-rooms, or who has already been presented, will send your name to the Lord Chamberlain, and he submits it to the Queen, and that's all." "What kind of dresses do the Queen and the Princess wear?" asked the reporter. "The Queen wore a rich dark velvet and a long train and her crown. But I looked mostly at the Princess of Wales; she does dress in such exquisite taste. She wore a dress of ciel-blue satin duchess, embroidered in silver-gilt draperies of the finest Brussels lace and looped with large bouquets of roses and lilies. The train was of ciel-blue brocade embroidered in colored flowers, and the corsage was made to correspond. On her head was a tiara of diamonds, a cluster of feathers and a lace veil, and she wore several orders, the Victoria and Albert, the Saxe-Coburg, the Crown of India, and others I forget now." "What did the Princess Beatrice wear?" "She wore white silk and satin and some pale pink mousseline de soie with roses to correspond, and beautiful diamonds and emeralds in the hair, and lots of orders. They wore all sorts of dresses and nearly all the ladies wore veils. Rather a funny idea, isn't it?"